Clothing in nineteenth-century Europe and America was so thoroughly dangerous, it’s amazing anyone survived. That’s what you might very well take away from Fashion Victims: The Dangers of Dress Past and Present, a lavishly illustrated chronicle of ways clothing tried to kill both creators and their customers in the Victorian era, largely in the U.K., France and North America. Author Alison Matthews David talks vivid-but-toxic dyes, cosmetics laden with lead, and flammable fabrics, pairing beautiful examples of popular styles with sometimes gruesome illustrations of the injuries they might’ve inflicted. “Fashion causes literal, physical harm to the bodies of its wearers and its makers and has done so for centuries,” she explains. For instance: A lovely emerald green used in fabrics and popular floral headdresses alike was made, in part, of arsenic. This would become an obsession on the part of the Victorian media. The following is excerpted from Fashion Victims. On November 20, 1861, Matilda Scheurer, a 19-year-old artificial flower maker, died of “accidental” poisoning. The formerly healthy, “good-looking” young woman worked for Mr. Bergeron in central London, along with a hundred other employees. She “fluffed” artificial leaves, dusting them with an attractive green powder that she inhaled with every breath and ate off her hands at each meal. The brilliant hue of this green pigment, which was used to colour dresses and hair ornaments, was achieved by mixing copper and highly toxic arsenic trioxide or “white arsenic” as it was known. The press described her death in grisly detail, and by all accounts, Scheurer’s final illness was horrible. She vomited green waters; the whites of her eyes had turned green, and she told her doctor that “everything she looked at was green.” In her final hours, she had convulsions every few minutes until she died, with “an expression of great anxiety” and foaming at the mouth, nose and eyes. An autopsy confirmed that her fingernails had turned a very pronounced green and the arsenic had reached her stomach, liver, and lungs. As Punch wrote sarcastically in an article entitled “Pretty Poison-Wreaths” two weeks later, “It was proved by medical testimony that she had been ill from the same cause four times within the last eighteen months. Under such circumstances as these, death is evidently about as accidental as it is when resulting from a railway collision occasioned by arrangements known to be faulty.” To the nonmedical public, it seemed that Scheurer’s death was predictable and entirely preventable and that her life had been cruelly sacrificed to wealthy women’s desire for fashionable adornments. Several philanthropic organizations took up her cause, including the aristocratic members of the Ladies’ Sanitary Association. One member, a Miss Nicholson, had already visited the garrets and workshops where flowers were made and had published a shocking firsthand account of following “half-clad” and “half-starved” little girls with bandaged hands and “some cutaneous disease” as they pick up an order of leaves and turn it into bouquets. Nicholson wrote that one of the girls stubbornly refused to work any more. She had observed her fellow flower makers in the workshop wearing handkerchiefs soaked with blood and she herself “had been kept on [working with] green . . . till her face was one mass of sores,” and she was almost blind. Nicholson’s article alerted her readers to the fact that the young, female workers were ignorant of the nature and effects of arsenical greens and “imagine that it gives them a dreadful cold.” After Scheurer’s death, the Ladies’ Sanitary Association commissioned Dr. A. W. Hoffman, an analytical chemist with a worldwide reputation, to test artificial leaves from a ladies’ headdress. Hoffman shared his results with the public in a London Times article sensationally titled “The Dance of Death.”The expert concluded that an average headdress contained enough arsenic to poison 20 people. 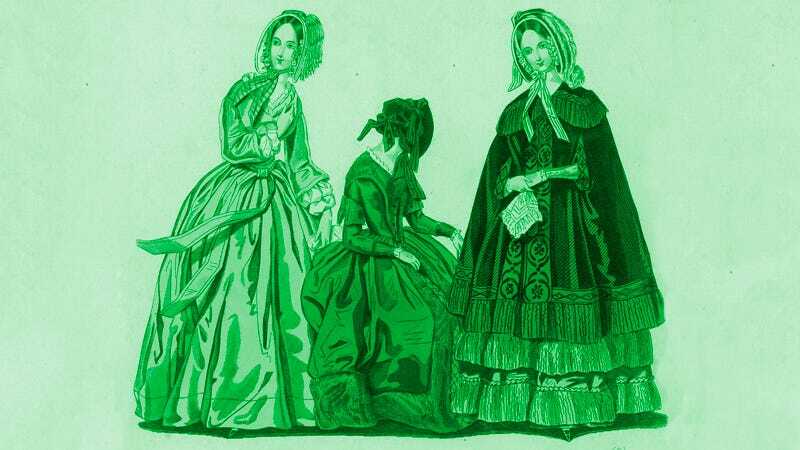 The “green tarlatanes so much of late in vogue for ball dresses” contained as much as half their weight in arsenic, meaning a ball gown fashioned from 20 yards of this fabric would have 900 grains of arsenic. A Berlin doctor had also determined that “from a dress of this kind no less than 60 grains powdered off in the course of a single evening.” A grain, based on the weight of a wheat grain, is equivalent to 64.8 milligrams or 1/7000th of a pound. Four or five grains were lethal for an average adult. A week after Hoffman’s inflammatory letter was published, the British Medical Journal called green-clad women “killing” (Victorian slang for attractive) femmes fatales: “Well may the fascinating wearer of it be called a killing creature. She actually carries in her skirts poison enough to slay the whole of the admirers she may meet with in half a dozen ball-rooms.” Female activists had called on chemists to warn the British public. Although wealthy women clad in green were fingered as murderers, it was privileged ladies from the same social classes who had blown the whistle on the dangers of arsenical green dress, calling on chemists to back up their claims. As these actions proved, artists were not the true colour innovators of the period; in the 19th century, the chemist had all but replaced the painter. Like the protean shapes of felt hats created with the help of chemical substances, science contributed a rainbow of man-made tints that was infinitely mutable and constantly shifting to suit consumer taste, resulting in frequent palette changes on men’s and women’s bodies. Colour was one scientific domain that women were encouraged to participate in, particularly as it related to dress. As Charlotte Nicklas has argued, colour science as propounded by the famous French dye chemist Michel-Euègne Chevreul frequently found its way into fashion periodicals aimed at middle-class women. Chemistry democratized previously expensive imported animal and mineral dyes forever, as suggested by the Victorian slang term “Totty-all colours,” meaning a woman who contrived to combine all the hues of the rainbow in her dress. Yet as with other consumer products, democratization came at a cost to health, and no colour was more toxic than the verdant pigment that killed Matilda Scheurer. After researching the ample material, medical, and chemical evidence of toxic colours in the 19th century, I find it surprising that fashion historians have not addressed this aspect of dress history. The substances used to tint dress and accessories left a trail of polluted air, water, and soil, sickening workers and consumers. Toxic green wreaths and poisoned flowermakers made headlines, but in the 19th century arsenic and the arsenophobia it provoked were everywhere. James Whorton’s book The Arsenic Century: How Victorian Britain was Poisoned at Home, Work and Play beautifully demonstrates just how ubiquitous the substance was. The “arsenious acid” or white arsenic (arsenic trioxide) that went into pigments, rat poisons, and medicines was a cheap, colourless substance, a fine, white powder obtained as a by-product of mining and smelting metals like copper, cobalt, and tin. Arsenic was used by doctors to heal and by murderers to kill, accidentally finding its way into food and even beer. A child could buy it over the counter in a pharmacy. The poison equivalent of fur felt hats, it could assume so many forms that it was called “the very Proteus of poisons.” In Britain, acts like the Control of Poisons Bill of 1851 and the Arsenic Act of 1868 were passed to limit the amounts that could be sold to individuals, but it was completely legal and unregulated for large- scale use in industry. Many hundreds of tonnes went into consumer products annually. Across the channel in France, Ange-Gabriel-Maxime Vernois (1809–1877), a consulting physician to the highest in the land, including Emperor Napoleon III, was conducting his own studies. Despite his high rank, he also had a strong interest in occupational hazards. In 1859, he had investigated artificial flowermaking workshops and found that the trade was making workers deathly ill. He described the health hazards of each operation in the trade and a chromolithograph illustrating his article graphically depicts how the toxic green dust ruined the hands and bodies of flower workers. In a workshop or factory environment, it was ground under fingernails and eaten off of dirty hands. It blistered toes peeping from holes in worn shoes, and settled on floors where it killed rats and mice. Vernois noted that flowermaking ateliers were one of the few workshops with no vermin or cats to catch them, save for one sickly feline specimen he observed. At night, workers carried the powder home on their clothes, or worse, it was spread all over the cramped apartments of “independent” piece workers. These arsenical tints also harmed the hands of their wearers, if less gravely. As late as 1871, a “lady who purchased a box of green-coloured gloves at a well-known and respectable house” suffered from repeated skin ulcerations around her fingernails until arsenical salts were detected. This was perhaps not surprising since trade manuals from the time suggest that some types of dyes were “simply brushed” directly on gloves in a liquid solution “with no further treatment” to fix the colours, and leather gloves could easily leach the substance onto the lady’s warm, sweaty hands. Although we have forgotten these dangers, the conservative world of Parisian haute couture has a longer, if hazy, memory of them. In the 2005 documentary Signé Chanel, one of the most powerful women in the Chanel haute couture house tells us that “seamstresses don’t like green.” This antigreen stance has become a mythic, vague superstition, linked with a fear of “bad luck.” Because the original Coco Chanel was so famous for her modernist black and white colour palette, we have a hard time imagining her using “natural” shades like green for her dresses. Her successor Karl Lagerfeld, himself attired in stark black and white, similarly shuns them. Yet Coco Chanel’s avoidance of certain hues for her collections may not have been purely an aesthetic choice. As Scheurer’s death proves, fears or superstitions surrounding the colour green in couture stem from concrete 19th-century medical logic. Gabrielle “Coco” Chanel, born to a working-class family in 1883, was orphaned at age 12. Nuns taught her to sew in the orphanage. By her early twenties, she was working in a fashion boutique. She soon had millinery shop of her own on the ground floor of her lover’s Paris apartment, learned the technical aspects of her trade from a professional called Lucienne Rabaté, and polished her skills with the “Queen of Milliners,” Caroline Reboux (1837–1927). Whether she learned about arsenical greens from the nuns at the orphanage, her employer at the boutique, or the professional milliners she worked with, her teachers belonged to an older generation who remembered and had perhaps experienced medical problems from arsenic firsthand. Though the French had banned arsenical pigments in artificial foliage by this period, it still tinted myriad consumer items and was widely used in the marketing and packaging of fashion goods. Retailers used green or green-trimmed “band” boxes to sell, carry, and store accessories. Tests of identical green paper shoe boxes in the Bata Shoe Museum revealed substantial amounts of arsenic, and in 1880 a chemist in Scotland found extremely high levels of arsenic in boxes like these. Given the historical evidence and the survival of so many arsenic-laced items, it is hard to believe that this story has been written out of fashion history except in vague superstitions recorded in a documentary film. Reprinted with permission from Fashion Victims: The Dangers of Dress Past and Present by Alison Matthews David (Bloomsbury, 2015). Lead image via Getty; second photo via Getty; successive images public domain, from the collection of the Wellcome Library.